Objective To determine the subjective response to iron therapy in non-anaemic women with unexplained fatigue. Setting Academic primary care centre and eight general practices in western Switzerland. Participants 144 women aged 18 to 55, assigned to either oral ferrous sulphate (80 mg/day of elemental iron daily; n=75) or placebo (n=69) for four weeks. Main outcome measures Level of fatigue, measured by a 10 point visual analogue scale. Results 136 (94%) women completed the study. Most had a low serum ferritin concentration; ≤ 20 μg/l in 69 (51%) women. Mean age, haemoglobin concentration, serum ferritin concentration, level of fatigue, depression, and anxiety were similar in both groups at baseline. Both groups were also similar for compliance and dropout rates. The level of fatigue after one month decreased by −1.82/6.37 points (29%) in the iron group compared with −0.85/6.46 points (13%) in the placebo group (difference 0.95 points, 95% confidence interval 0.32 to 1.62; P=0.004). Subgroups analysis showed that only women with ferritin concentrations ≤ 50 μg/l improved with oral supplementation. 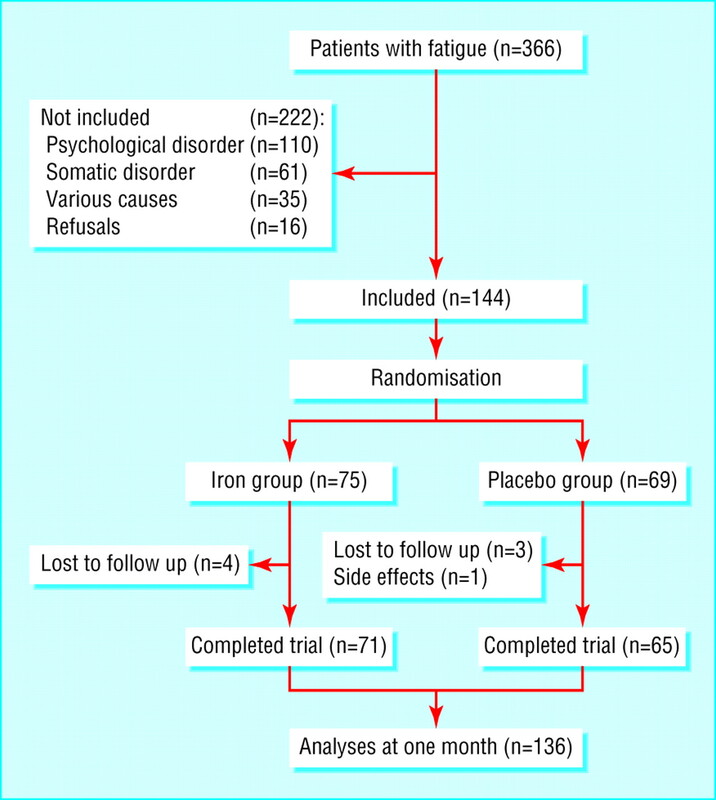 Conclusion Non-anaemic women with unexplained fatigue may benefit from iron supplementation. The effect may be restricted to women with low or borderline serum ferritin concentrations. Fatigue is common in the general population. Prevalence rates of 14% to 27% have been reported in primary care, and in 1-2% of patients fatigue is the main reason for consultation.1–6 Women were three times more likely than men to mention fatigue in a study conducted in general practice.7 Although the symptom of fatigue is related to iron deficiency anaemia, evidence is lacking for any association between iron deficiency and tiredness in the absence of anaemia. Iron deficiency associated with increased fatigue was, however, shown in a recent longitudinal study on women's health.8 In a European study, about 20% of women of childbearing age had a serum ferritin concentration less than 15 μg/l, and only 4% of these women had iron deficiency anaemia.9 We examined the effect of iron therapy in women with unexplained fatigue in the absence of anaemia. Our study was conducted in a primary care setting: an academic centre (57 patients) and eight private general practices (87 patients). Participants were recruited from December 1997 to March 2000. Women aged 18 to 55 were included if their main reason for consulting was fatigue. We excluded women with anaemia (haemoglobin concentration < 117 g/l), other obvious physical or psychiatric cause for fatigue, or chronic fatigue syndrome. Violations of the protocol detected after randomisation led to exclusion of women only in a complementary per protocol analysis. Reasons for these late exclusions had been determined before-hand: pregnancy diagnosed during the study period, haemochromatosis, physical or mental disorders identified after inclusion, and vitamins or iron supplements taken during the trial. Our study was a pragmatic randomised placebo controlled trial. Participants received either 80 mg/day oral long acting ferrous sulphate (Tardyferon; Robapharm, Boulogne) or placebo for four weeks. Iron and placebo were identical in appearance and taste and for dose regimen. Randomisation took place at an independent pharmacy, according to a pre-established list. Patients, caregivers, and investigators were blinded to treatment assignment until the end of the trial. Each drug package was coded with a unique number according to the randomisation schedule and then posted to the relevant practice. The codes were held by the pharmacist and remained unbroken until the analyses were completed. The main outcome was the level of fatigue perceived by patients, assessed at baseline and after one month on a 10 point visual analogue scale, ranging from 1 (no fatigue at all) to 10 (very severe fatigue). Also used was a validated 24 item self administered questionnaire incorporating eight items for each of three dimensions (fatigue, anxiety, and depression).10 Levels of depression and anxiety were examined as additional outcomes. Each item was scored on a visual analogue scale. A cumulative score was obtained for each dimension by adding the eight item scores (range 0-40). The patients were asked about any potential side effects and intercurrent physical, psychological, and haemorrhagic events. Serum ferritin concentration and adherence to treatment were measured and considered as intervening variables. A complete blood count was obtained at baseline, and the serum ferritin concentration was measured by chemoluminometric immunoassay. Clinicians could order other tests to rule out any disorder to explain the fatigue. Serum ferritin concentration was measured after one month in those patients whose initial value was ≤ 20 μg/l. Adherence to treatment was measured by an electronic device (MEMS; Aardex Europe, Switzerland), which recorded the date and time that the pill container was opened.11 Unused pills were also counted. Adherence was quantified by dividing the number of times the device was opened by the total number of days of observation. Patients were asked not to take over the counter vitamin or iron supplements. An estimated sample size of 63 patients was needed to detect a one point difference between the groups on the visual analogue scale. The calculation included an estimated standard deviation of two points for a two tailed test (α=0.05, power=0.80). We calculated changes in symptom levels and scores over time for each patient by subtracting the results at follow up from those at baseline. The principal analysis was performed according to an intention to treat protocol. Tests performed were two sample t tests, χ2 tests, and linear regression analyses. A per protocol analysis was also conducted. In 366 women, fatigue was the main reason for consulting; 222 were excluded because of psychiatric disorders (110 women), physical disorders (61), refusals (16), or other reasons (35). Of the 144 patients enrolled, 136 (94%) completed the intervention, seven (5%) were lost to follow up, and one withdrew because of nausea and vomiting (figure). The groups had similar characteristics at baseline (table 1). Low serum ferritin concentrations were common: ≤ 50 μg/l in 115 (85%) patients and ≤ 20 μg/l in 69 (51%) patients. Scores for anxiety and depression were low in both groups. The mean decrease in the overall intensity of fatigue between zero and one month was higher in the iron group than in the placebo group (−1.82 (SD 1.7) ν −0.85 (2.1) points, difference 0.95 points 95% confidence interval 0.32 to 1.62, P=0.004; table 2). By choosing a cut-off point of 50 μg/l, we found that there was no quantitatively significant response greater than 50 μg/l (P=0.64). The iron group showed the largest decrease in the cumulative score for fatigue (−7.5 (8.0) ν −4.6 (7.5) points, difference 3.0 points, 0.3 to 5.6, P=0.03). The difference for depression was not statistically different between the two groups (−2.1 (6) ν −1 (7) points, P=0.31), whereas a greater decrease in anxiety was observed in the iron group (−1.7 (6) ν 1.3 (6), P=0.003). After adjustment for age, initial levels of depression and anxiety, and serum ferritin concentration in a multiple linear regression analysis, iron supplementation was the most important variable to be associated with the decrease in the overall intensity of fatigue, an effect corresponding to −1 point on the visual analogue scale. Younger age was also associated with a larger decrease in the intensity of fatigue. A multiple linear regression analysis in the iron group showed that age, initial levels of depression and anxiety, serum ferritin concentration, and haemoglobin concentration were not predictive of the mean decrease in the overall intensity of fatigue. The best predictor of response was the amount of pills consumed in the iron group, but this was not so in the placebo group. Compliance and dropout rates were similar in both groups: 95% (12) ν 98% (9), P=0.25) for compliance and4of75(5%) ν 4 of 69 (6%) for dropout rates in the iron arm and placebo arm, respectively. After the intervention, serum ferritin concentrations were highest in the iron group (21.0 (SD 9.2) ν 13.7 (6.9), P < 0.001). After exclusion of five patients, a per protocol analysis was no different from the intention to treat analysis. We found a significant response only in the patients with a baseline serum ferritin concentration ≤ 50 μg/l. This suggests that iron deficiency could be present even with a “normal” concentration of serum ferritin. Indeed, the lower limit for serum ferritin concentration is controversial: iron stores in the bone marrow may serve as a better indicator of iron deficiency.19 One study compared serum ferritin concentrations with iron stores in the bone marrow and found that a serum ferritin concentration of 50 μg/l was associated with a 50% chance of iron deficiency occurring in the bone marrow.20 The lower reference limits for serum ferritin and haemoglobin concentrations have been considered too low for women.21 The authors of that study advocate the adoption of the same reference values for both men and women that “would be expected to have fundamental and positive implications for women's health and welfare.” Our study indirectly supports their conclusion by showing that women can benefit from iron supplementation even if their red blood cell counts are considered normal. Iron deficiency even in the absence of anaemia is associated with decreased activity of iron dependent enzymes and therefore affects the metabolism of neurotransmitters.2223 In people with iron deficiency anaemia the related symptoms will disappear more quickly than the accompanying increase in haematological indices.24 This suggests that some cellular functions are affected by iron treatment independently of haemoglobin concentration. We did not, however, measure haemoglobin concentration after exposure to iron and therefore did not assess whether people who had low but normal haemoglobin concentrations had an increase in haemoglobin concentration that could be associated with a decrease in fatigue. Our study has several limitations. Firstly, blinding for group assignment is an important issue, especially with iron, because of the side effects. It was not possible to correct for the change in stool colour by adding bismuth to the placebo because bismuth is an active substance. To minimise the side effects we used a low dose iron sulphate taken with breakfast. Participants in both groups were also told that their drug could colour stools. We did not ask the participants to guess their group assignment. In a recent placebo controlled trial no significant differences in guesses about treatment were found between iron and placebo groups despite the elemental iron dose used being three times that of our study.14 We found no difference in compliance between the two groups suggesting that the patients did not recognise that they had been assigned to placebo. Secondly, we did not have a procedure to control recruitment of all consecutive eligible patients, because this would have been difficult to apply in a busy clinical practice. Thirdly, ferritin concentration was the only measure of iron status in the study because it is considered the best non-invasive indicator of iron storage.20 Finally, our primary outcome focused on fatigue, a patient centred subjective measure. We thank M Burnier for his contribution to the electronic monitoring of patient compliance and for his critique of the manuscript and W Ghali (University of Calgary, Alberta, Canada) for his comments on the revised manuscript. Contributors: FV, BB, CLF, and BF participated in the conception and design of the study, analysis and interpretation of data, drafting and revising the manuscript, and inclusion of patients for BF and FV. CB, MG, AM, TB, MdeV, J-PS, LH, CC, JT, and AP participated in the conception and design of the study, inclusion of patients, and drafting and revising the manuscript. BF will act as guarantor for the paper. Funding This study was sponsored by Robapharm. The sponsor was not involved in the analysis of the results nor in writing or correcting the manuscript. Competing interests FV and BF received financial support from Robapharm for producing a preliminary report of the study. Ethical approval: The study was approved by the ethical review committee for clinical research of the Department of Internal Medicine, University of Lausanne.
. Fatigue in primary care. J Gen Intern Med 1992; 7: 276–86.
. Prevalence of fatigue and chronic fatigue syndrome in a primary care practice. Arch Intern Med 1993; 153: 2759–65.
. The prevalence of symptoms in medical outpatients and the adequacy of therapy. Arch Intern Med 1990; 150: 1685–9.
. Population based study of fatigue and psychological distress. BMJ 1994; 308: 763–6.
. Evaluation of fatigue in family practice. J Fam Pract 1984; 19: 643–7.
. Fatigue as a presenting complaint in family practice. J Fam Pract 1980; 10: 795–801.
. Patients with fatigue in general practice: a prospective study. BMJ 1993; 307: 103–6.
. Iron deficiency, general health and fatigue: results from the Australian longitudinal study on women's health. Qual Life Res 2000; 9: 491–7.
. Determining factors in the iron status of adult women in the SU.VI.MAX study. Eur J Clin Nutr 1998; 52: 383–8.
. Questionnaire bref d'auto-évaluation des dimensions dépressive, asthénique et anxieuse. Ann Med Psychol 1984; 142: 862–5.
. Compliance assessment in clinical trials: the MEMS device. J Clin Res Pharmacoepidemiol 1990; 4: 199–204.
. Iron therapy in chronically fatigued, nonanaemic women: a double-blind study. Ann Intern Med 1960; 52: 378–94.
. Iron state in female adolescents. Am J Dis Child 1992; 146: 803–5.
. Randomised study of cognitive effects of iron supplementation in non-anaemic iron-deficient girls. Lancet 1996; 348: 992–6.
. Dietary and supplement treatment of iron deficiency results in improvements in general health and fatigue in Australian women of childbearing age. J Am Coll Nutr 2001; 20: 337–42.
. What makes women tired? A community sample. J Women's Health 1998; 7: 69–76.
. Gender differences in fatigue: biopsychosocial actors relating to fatigue in men and women. Med Care 1999; 37: 1078–83.
. The mental health of patients with a chief complaint of chronic fatigue. A prospective evaluation and follow-up. Arch Intern Med 1988; l48: 2213–7.
. Screening for iron deficiency: an analysis based on bone-marrow examinations and serum ferritin determinations in a population sample of women. Br J Haematol 1993; 85: 787–98.
. Laboratory diagnosis of iron-deficiency anaemia. J Gen Intern Med 1992; 7: 145–53.
. Why should women have lower reference limits for haemoglobin and ferritin concentrations than men? BMJ 2001; 322: 1355–7.
. Iron deficiency: does it matter? J Intern Med 1989; 226: 367–72.
. Functional consequences or iron deficiency in human populations. J Nutr Sci Vitaminol 1984; 30: 47–63.
. Work capacity heart rate and blood lactate response to iron treatment. Br J Heamatol 1979; 41: 365–72.